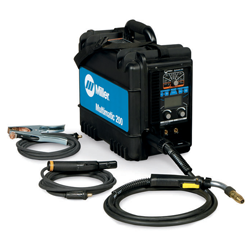 One Source Equipment Rentals has the Miller 12VS suitcase mig welder for rent or sale. These wire feed welders provide smooth and consistent wire delivery in a portable unit. Units are light weight and well balanced for ease of carrying to remote welding sites. We offer parts, and service, for customer machines. We also sell new and used welders. Call us today for all your welding needs. * Welding leads, ground clamps, and electrode holders are available for rent or sale. One Source Equipment Rentals has the Miller Multimatic 200 for rent or sale. This unique all-in-one can be used for MIG, Flux-cored, DC TIG, and DC stick welding.